Interviewer: Have you always been interested in the dark side of life? 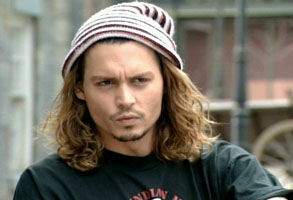 Johnny Depp: Yeah, yeah. I'm interested in extremes of all kinds, you know. The dark side, the light side, the negative, and the positive. I don't know why. Human behavior really is the most fascinating thing. What do you think of the view that The Ripper was the very first tabloid star? I agree with it. He was perversely elevated to the status of celebrity. It was the first time that had happened. The Ripper case, in a way, gave birth to tabloid journalism. From Hell is a classic London story. But where did you film it? The Czech Republic! I really don't know why. All I know is that when I arrived in the Czech Republic, they drove me about 30-40 minutes outside Prague, to the studio, and they had built 8-10 blocks of Whitechapel, 1888, in staggering detail, in the middle of a field. So what was it like to be standing there, to suddenly be transported back in time? It was extremely bizarre. The day before I'd been to Whitechapel in London, and had visited the 10 Bells and the various murder sites, the church and the general neighborhood. And then the next day I'm standing in the exact same spot except one hundred and something years earlier. It was so beautifully done. The detail was amazing. Do you mean you went on The Ripper Tour? Kind of. I went with one of the experts, the Ripper-ologists. He took me on the walk and explained all the details, because a lot of the murder sites are now gone. There are buildings on top of them. We hear that you hang out in London quite a lot and we were wondering why you particularly like the city? It's easy to like it, just look at it! It's an amazing place, amazing people. When we did Sleepy Hollow I was here for six months and that was one of the greatest times I've ever had. It's beautiful, it's got great history, great people, an interesting culture . . . the list is endless. And is it right that you're going to open a bar here? I just heard that today and that's the first I'd heard of it! A couple of people have said to me “How's the bar going?” and I thought they meant The Viper Room in Los Angeles. I'm always coming across small fictions like that about me. It's part of the deal I guess. So let's talk about Robbie Coltrane—you've said he's your hero—why do you think he's such a cool guy? He's the perfect example of what a man should be. He's a great man, a loyal man, he's a great actor, a great comedian, a beautiful friend, a beautiful father. He's amazing. I'm going to call him 'BAFTA Coltrane' from now on. I'm sure he'll clean up at the Academy Awards. On the set of From Hell you had Robbie from Harry Potter and Ian Holm from Lord Of The Rings. Did you find out much insider gossip from those films? Ian showed me these photographs of himself in his prosthetic makeup, which was pretty impressive. And I got a few Harry Potter stories out of old Coltrane. But I still haven't seen the films yet. I don't go to the movies so much. They'll come around at some point. I prefer the comfort of ignorance in terms of the industry. I don't like knowing which movies are making money. I don't like knowing what the new thing is, who's popular, who's not popular. I find great comfort in not knowing these things.